As long as Magic the Gathering Arena is going Open Beta, there will be a lot of Hearthstone players who are willing to check out MTGA. So we’ve found a very nice Hearthstone player’s guide originally posted by gualdhar on Reddit to help you get comfortable with new CCG. Both games have a resource called Mana which you use each turn to cast spells, and replenishes when your turn starts again. In Hearthstone mana is given to you without expending other resources, and you always get an additional mana to use each turn, up to 10. 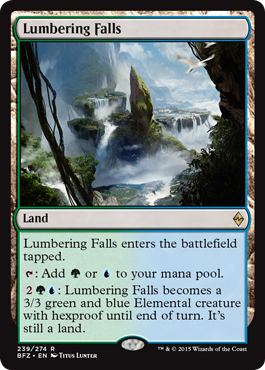 In Magic, players get mana by playing and using Lands. Lands take up space in your deck. By default, you can play one land from your hand per turn. Each turn, you may tap, or use, a land to produce one mana of the appropriate color; plains produce white mana, forests make green, mountains make red, swamps make black and islands make blue. At the start of each of your turns you untap all your lands. In paper magic, tapping is signified by turning the card 90 degrees sideways, and untapping brings it back upright. 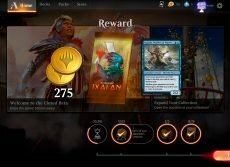 In Magic Arena, tapped cards are shown slightly tilted, grayed out and with a tap symbol on top of them. Think of tapping a card as exhausting it’s power for the turn, and untapping it as recharging it. You use mana to pay the cost of a spell, which is located at the top right corner of the card. For example, Nezahal, Primal Tide requires 7 mana total to cast. Two mana must be blue (the water drops), and five can be mana of any color. It’s important to note that unlike Hearthstone you’re not guaranteed to get a new land to play each turn, and lands also take up space in your deck. Most decks run about 40% lands, depending on how fast or big the deck is. Also, it’s possible for your shuffled deck to draw too many or too few lands in a game. This is called Mana Screw, it happens to everyone occasionally. That’s why official paper Magic matches are best of 3 games. Finally, the lands I referenced before (Plains, Island, etc) are called Basic Lands. You’re allowed to have as many of each in your deck as you want, but they’re, well, basic. They just tap for a single color and don’t do anything special. There are also non-basic lands which do all sorts of fun things. Many tap for more than one color of mana, some do things when they come into play, some have special abilities besides making mana, some even become creatures. Non-basic lands fall under the same deck building restrictions as other cards though, namely you can’t have more than 4 in your deck. In Hearthstone, you have nine classes, each of which gets access to exclusive cards, and a bunch of other cards that can be used by any class. In Magic, you have five different colors; White, Blue, Black, Red, and Green, often shortened to WUBRG (U is for blue). Decks may play as many colors as they wish and in any combination. Each color has a unique role, along with strengths and weaknesses. This is known as the color pie. You can learn everything you’d want to know about color and the color pie at [MTGSalvation’s page.] (http://mtgsalvation.gamepedia.com/Color_Pie) It’s important to note that while the meta changes from set to set, no one color is inherently stronger than another. Each color simply answers the question “how do I win?” differently. Also, while most cards have one color, some have more than one, and some have none. White: The color of healing, protection and order. White has a lot of small creatures that build on each other, and Angels that serve as medium-to-big fliers. Combat tricks involve preventing damage dealt by opponents or preventing creatures from attacking. 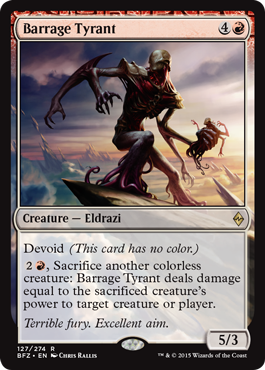 White also has a number of “board wipes”, that kill off all creatures or all non-lands on the board. Blue: The color of logic, technology, air and water. Blue loves to control the board by drawing extra cards, countering spells, bouncing creatures back into their owners’ hands, and even milling (making a player move cards from their library directly to their graveyard). 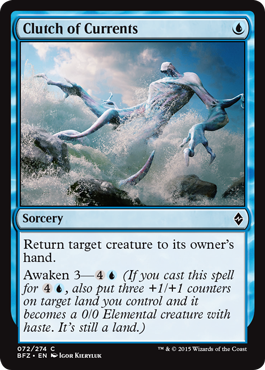 Blue creatures are a bit weaker, but many have flying or similarly evasive abilities, which can lead to a blowout if your opponent can’t deal with them. Black: The color of death, selfishness, and power at any cost. Black isn’t necessarily evil, but it’s rarely used for good. Black loves bringing creatures back from the graveyard, destroying creatures outright, or sacrificing its own creatures to get an edge. Black often uses its life total for advantage, like drawing extra cards or powering up creatures. Black can also force opponents to discard cards from their hand, sometimes even choosing which card for their opponent. Red: The color of impulsiveness, chaos, fire, lightning, and earth. Red loves dealing damage directly to creatures or players. Its creatures attack fast and hard, even if they’re not the most resilient, and some creatures can even power themselves up with mana. Red also loves playing dragons. Green: The color of nature, instinct and survival. Green loves big, lumbering creatures, and has spells to get lands on the board fast to play those big creatures quickly. Green also has combat tricks that beef up their own creatures, or make creatures fight each other outside of normal combat. Green also hates fliers, and has effects to deal with them while not giving their own creatures flying. Creature: Just like Hearthstone, these are your army. You use them to attack, and defend from attacks. They have power (combat strength) and toughness (hit points) listed on the bottom right-hand corner. Enchantment: Spells that effect the battlefield as long as long as they’re in play. Some have passive effects, some have interesting abilities. An enchantment that only affects a single card is called an Aura. Sorcery: Like Spells in Hearthstone. They can only be played on your turn during your main phases, have an immediate effect, and are placed in the graveyard afterwards. Instant: Like sorceries, they have an immediate effect and go to your graveyard afterwards. However unlike sorceries, they can be played at any time, even on your opponent’s turn or in response to another spell or ability (see the section on phases of a turn and prority). So long as you left lands untapped for them. Artifact: Like enchantments, they stay on the field and have an effect, or have an ability. Generally, an artifact is a “thing” where an enchantment is “magic.” Artifacts are usually colorless. Creatures can also be Artifacts, and Equipment artifacts can be given to a creature like weapons can be given to heroes in Hearthstone. Equipment stays on the battlefield if the equipped creature dies, and can be switched around during your turn. To equip something to a creature, you must pay the equip cost listed on the card. Finally, some artifacts are Vehicles. They’re not normally creatures, but they can be turned into creatures by using your creatures to crew them. Planeswalker: A special “ally”, usually famous characters in MTG lore. Each has loyalty, and can use one ability once per turn, which changes their loyalty. 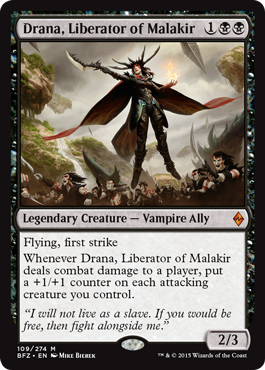 Planeswalkers must have at least as much loyalty as the ability uses if it removes loyalty, and a planeswalker with 0 loyalty is dead. They cannot usually attack or block like regular creatures. They’re kind of like hero cards, if you could choose one of three to use each turn. You’ll notice some of these cards are legendary. Legendary cards are special pieces of MTG lore. You can’t control two legendary cards with the same name on the battlefield at the same time. If that ever happens, you have to choose one and put the other in your graveyard. Here’s an example: you can’t have two copies of the planeswalker Huatli, Warrior Poet under your control. 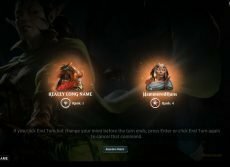 But you can have one of them along with Huatli, Radiant Champion on the battlefield at the same time, since even though they’re the same character, the cards themselves have different names. Also, even if you have Huatli, Warrior Poet in play, your opponent may still play his own Huatli, Warrior Poet. Cards, especially creatures, can also have subtypes. This refers to any characteristics of the card, and creatures, spells or abilities may reference a card subtype for a certain effect. For example, Legion Lieutenant is a creature, more specifically a Vampire Knight. If there are other Vampires on the battlefield, Legion Lieutenant gives each an extra 1 power and 1 toughness. Spells can have no subtypes, one, a few, or literally all of them. Here be Dragons: This is important, but can be complicated if you’re seeing this for the first time. Feel free to skip ahead to Phases of a Turn and come back to this when you finish the rest. When a card is on the battlefield (in play, on the board), it’s always considered to be whatever type or subtype is listed on the card. However, when a card is not on the battlefield (like when it’s in your hand, library, or graveyard) it’s referred to as a card, and if necessary by the types listed on it. 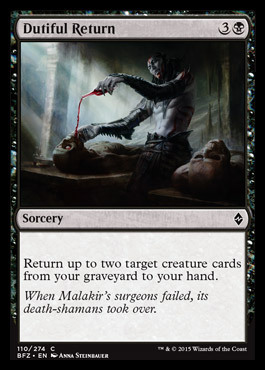 So for example, Dutiful Return refers to cards of the type creature that are in your graveyard. It cannot refer to a creature that’s on the battlefield, since it wouldn’t be considered a card. Also, any non-land card that is actively being cast (called “on the stack,” see The Stack later on) is called a spell. 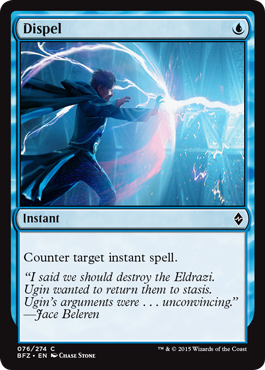 For example, Dispelhas an ability “Counter target instant spell.” That means if someone just cast a spell, and the type on the card is “instant”, you can cast Dispel in response to counter it (make it not work). If you look at Clutch of Currents, its ability doesn’t refer to either cards or spells. That means it will only work on creatures that are already on the battlefield, not creatures in the graveyard or about to be cast. - Upkeep Step: Some cards ask you to do things here. Otherwise ignore it. - Draw Step: Draw a card. Main Phase: Play lands, cast spells, summon creatures, and so on! Combat Phase: You only get to attack once per turn, and this is when you do it. - Beginning of Combat Step: Some cards make you do things. - Declare Attackers Step: Choose which creatures are attacking this turn. - Declare Blockers Step: Defender chooses which of his creatures block which of yours. - Combat Damage Step: Combat damage is dealt simultaneously. Dead creatures die. - End of Combat Step: Some cards do things here. Main Phase: Cast more spells! - End Step: Some cards do things here. Last chance to cast instants this turn. - Cleanup Step: "Until end of turn" effects go away. Damage is reset. The biggest difference is that there’s a distinct “combat phase”. You do all your attacking then. You can play any spell you want on your turn before or after combat. During combat you’re limited to instant spells or abilities, which you can use at any step during the combat phase. There’s also this thing called priority. Priority is a rules-enforced way of saying your opponent can respond to your spells (with instants or activated abilities only) or do things at certain times during your turn. Your opponent gets priority automatically at the end of every step, even if you don’t do anything. The Stack is how spells and abilities resolve when you make plays in response to something. Each time you play a spell or ability it goes on the stack, and your opponent has a chance to respond with a spell or ability. If they do that spell or ability goes on the stack, and you then get a chance to respond. This keeps going until both players agree to stop. Then the last played ability or spell comes off the stack and goes into effect, then the next one down, and so on. Each time a spell or effect comes off the stack, each player gets another round of priority to react. You can picture it like a literal stack of cards. The first one played is on the bottom, then the next one goes on top of it, and so on. Once players stop, you take the top card off the stack, it does its thing, then the next card comes off the top, and so on. The only things which don’t use the stack are mana abilities. These are abilities which produce mana, like lands. Some creatures like Drover of the Mighty also produce mana. So these mana abilities just happen, and no one can react to them. Note: In face-to-face Magic, people use lots of shortcuts. People don’t literally say “pass priority” on every step, and early turns might just be “draw, play land, your turn.” However, it’s a good idea to get used to saying “go to combat?” or similar to offer your opponent the chance to do something before you reveal which creatures you’re attacking with. If you want to do something at the end of your opponent’s turn, you can say “on your end step” once your opponent ends his turn (just don’t untap things first, then it’s too late!). Magic Arena often takes shortcuts if you don’t have a play, and has a button to skip to the next turn, or you can place stops on certain turn phases to skip ahead to that place in the turn. Like I said before, you get one chance per turn to attack your opponent. You always go through the combat phase, even if you choose not to attack with any creatures. If you don’t choose attackers nothing usually happens, but some cards still have effects go off. If you want to attack, you choose which creatures are going unto the breach, and which player or planeswalker they’re attacking. You cannot attack a creature directly. You can attack planeswalkers directly, but combat is functionally the same until damage is dealt. Once you declare your attackers, your opponent can choose which creature(s) he wants to block with his own. Multiple creatures can block a single attacker, but a single blocker can only block a single attacker. If a creature is blocked, the attacking and blocking creatures assign damage equal to their power to the other creature. If an attacker has multiple blockers, the attacking player chooses how damage is assigned. Any attacker that isn’t blocked does damage to the blocking player or to the planeswalker (planeswalkers lose loyalty counters equal to the damage dealt). If a creature takes damage in a single turn greater than or equal to its toughness, it dies. Any damage that doesn’t kill a creature is reset at the end of each turn. Also important: when a creature attacks, it becomes “tapped”, or used. It doesn’t untap until your next turn. You can’t block with a tapped creature. Blocking does not tap your creature. Deathtouch: If a creature with deathtouch does any damage to another creature, the other creature dies. Toughness or the amount of damage doesn’t matter. Maexxna would have Deathtouch. Defender: Creature can’t attack. Think of a brick wall. Ancient Watcher would have defender, though in Magic creatures with defender aren’t useless without a combo. They can still block. First Strike: Usually creatures assign damage simultaneously. This creature does damage before creatures without First Strike do. If an attacking First Strike creature would kill a blocking non-First Strike creature, the blocker would die and do no damage to the attacker. If the First Strike creature is blocked by multiple creatures, and creatures still alive after the First Strike one does damage will hit the First Strike creature normally. Flying: Fliers can only be blocked by creatures with Flying or Reach. Haste: Like Charge. Can attack or use abilities that would tap it the turn it comes into play. Lifelink: Any damage the creature deals is given to its controller in life. 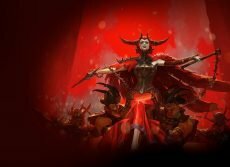 Mistress of Pain would have Lifelink. Trample: Normally a blocked attacking creature would not deal damage to the defending player. With Trample, the attacker deals exactly enough damage to the blocker to kill it, and the rest is dealt to the blocking player. Trample means nothing if it’s on a blocker. Indestructible: Creatures with indestructible are harder to kill than normal. They don’t die if you do lethal damage to it, and they don’t die to spells or effects that say “destroy”. You can still use spells that say “exile target creature”. Also, if the creature has 0 toughness for some reason (for example Moment of Craving) it will still die. Some cards have abilities on them that have to be “turned on”. This is done by paying some cost to activate the ability. Zacama, Primal Calamity for example, requires you to pay 3 mana (at least one red). If you do, it deals 3 damage to another creature. Each activated ability is structured the same way: COSTS:ABILITY. Everything before the colon pays for everything after the colon. Some costs only require you to tap the card with the ability, and some require you to pay other costs like life or sacrificing creatures. Remember a creature can’t use an ability that requires it to tap the turn it comes into play, unless it has haste. Standard (present in MTGA): Arguably the most played format in the game. Standard involves 5-8 of the most recent sets in the game. Decks contain 60 cards, and have the normal restriction of no more than 4 copies of any card (with the exception of basic lands). Every fall, there’s a big rotation, where the oldest 4 sets leave Standard. It’s timed to coincide with the release of the fall set. Right now, Kaladesh, Aether Revolt, Amonkhet, Hour of Devasation, Ixalan, and Rivals of Ixalan are in Standard. 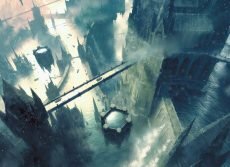 In a month, Dominaria will be released, followed by Magic 2019 in the summer. Once the fall set is released (as of yet unnamed), the first four sets listed will leave standard. Sealed (present in MTGA): You’re handed 6 packs of cards, and you use them (plus basic lands) to make the best 40 card deck you can. You then play against other people getting the same cards. This format is often slower and less powerful than constructed formats like Standard, and relies a bit on the randomness of the packs you get. However, this forces everyone to be on the same playing field. No buying powerful cards to throw in your deck. I recommend this format for new players especially. Also, before each set is released, stores will have Prereleases, where everyone gets prerelease packs of 6 packs plus a foil promo rare or mythic. They’re very popular and often have lots of new players. Draft (present in MTGA): My favorite format. Draft involves around 8 playes sitting around a table, picking cards one at a time out of packs of cards they pass around. Think of it kind of like the NFL draft or something. You’ll need to learn not just how to play your deck, but also how to evaluate cards in the set, determine which colors are open at your seat, and try to pick the best cards you can, then make a 40 card deck with them just like Sealed. These decks are between Sealed and Standard in powerlevel. Modern (NOT present in MTGA): This is a constructed format like Standard, except it uses older cards. Modern involves any card released since Eighth Edition in 2003. There’s no rotation like Standard, but because some cards have proven to be so powerful they warp the format, there’s a healthy ban list. Recently a couple cards were removed from the ban list as well. Generally the format is more expensive to get into than Standard, but the metagame doesn’t shift as drastically with new sets, so your deck will (usually) be as good in a year as it is today. Technically, any standard deck is almost always Modern legal, but the powerlevels are vastly different. Legacy (NOT present in MTGA): This is like Modern, except with any card in the history of Magic (again, except for the banned and restricted list). The Legacy metagame doesn’t shift very much, but there are a wide variety of decks and archetypes available to try. Commander (NOT present in MTGA): This is a constructed format with a twist. You choose any legendary creature as a “Commander”, then construct a 100 card deck involving single copies of cards which match the commander’s colors. This is designed to be played in groups of 4 people, though you can play with more or less if needed. If you want to try the format, Wizards of the Coast sells pre-made Commander decks which have interesting commanders and can be upgraded fairly easily.